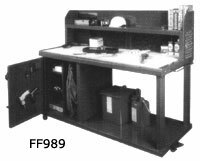 Most solid workbenches available, these all-welded workbenches feature a wood-filled 3/16" steel top, with 11 gauge steel legs and stringers for extra strength and rigidity. Bolt-down footplates are standard. 5000 lbs capacity all-welded bench. Designed for workshop applications, these benches feature a 1 3/4" thick solid laminated hardwood top mounted on a pair of all-welded pedestals with 2 shelves, 18" W x 24" D x 32" H each. 2500 lbs capacity pedestal bench. 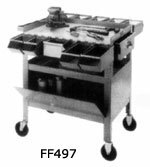 These machine stands are designed for use as a machinery stand, or as a work table when a full sized workbench is necessary. Features include: all welded 14 gauge steel; 2" lip-down shelves; bolt down footplates on each leg, and blue enamel finish. Model no. Dimension Cap. lbs. Model no. 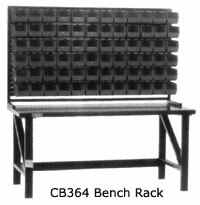 Description Overall Height"
Model CB364 all-welded louvered bench rack is designed to be permanently installed on a 72" wide workbench. 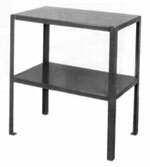 Dimensions are 72" W x 40" H.
Model CB363 all-welded louvered bench rack is a self supporting workstation organizer. 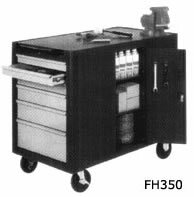 Dimensions are 35 3/4" W x 22" H.
Model FF497 Heavy-Duty Mechanic's Cart is a rugged workstation on wheels, featuring 12 gauge arc-welded construction. Standard features include: 1600 lbs capacity 5" easy rolling casters w/toe brakes; tubular push handle; locking drawers; locking storage cabinet; 2" rim on three sides; 3 compartment middle shelf, and 10 steel stackbins w/bin hangers. Overall size: 30" W x 20" D x 37 1/2" H.
Model FH351: 7 spacious drawers on the front side of this unit. 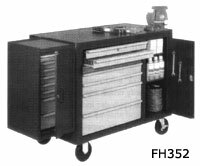 This mobile workbench station combines a workbench, security locker, service cart, and safety cabinet. 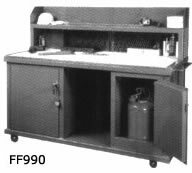 Model FF990 incorporates a flammable liquid storage cabinet in addition to the security locker, for the safe storage of flammable and combustible liquids at the worksite. Provide storage for two 5 gal. cans or miscellaneous sized containers. Constructed of all-welded, reinforced 18 gauge steel. Leak-proof sill and 2" sump aid in spill containment. Bilingual warning label. 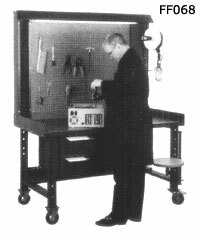 Safety storage cabinet designed in accordance with NFPA and OSHA specifications. Shipped fully assembled and ready to work. Tops are available in steel wood core, laminated wood, plastic laminate or multi-laminated shop top versions, 30" W.
Options include cyclinder locks to prevent unauthorized access, extra drowers and shelves. Shown: model FH393 with FH183 top. Please - click on the picture for more information about stools. Above listing is not complete, many other models available.